If you haven’t guessed at this point, I love baking desserts. And this summer I’ve become mildly obsessed with fruit desserts. I think it started with the Strawberry-Rhubarb crepes and just kinda snowballed from there. The best thing about fruit desserts, you can eat them as a fairly healthy breakfast. I’m serious. Normally I just have toast and tea (or pastry and tea) but with fruit dessert you get all the joy of a pastry, and 1-2 servings of fruit first thing in the morning. It’s awesome. This week’s dessert was inspired by my favorite food blog, NPR’s Kitchen Window. They are very hit or miss, but when they hit it’s gold. This week’s inspiration came from a column on American fruit desserts, basically moving beyond pie and crumbles. I wanted to do another rhubarb recipe, because I had some in my fridge and it needed to be used. Since I didn’t see a rhubarb recipe that appealed to me, I decided to make something up. 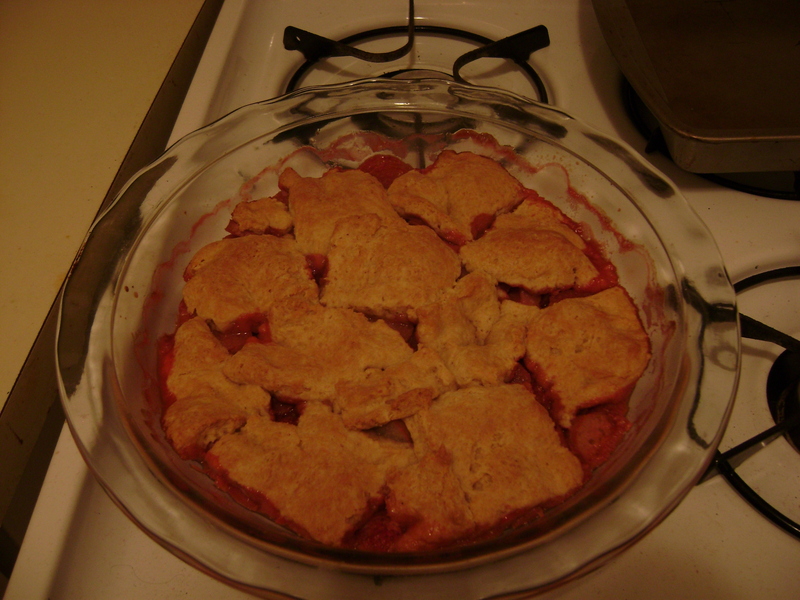 So I made a strawberry-rhubarb cobbler. For the filling, I just chopped up a large stalk of rhubarb, a bunch of strawberries, and about a tablespoon or two of brown sugar. Mixed them all together and dumped it in a pie plate. Cobbler topping is basically biscuits. I never actually measure when I make biscuits anymore. I just dump flour, baking powder, sugar, butter, and milk and it works. Though this time I used half white flour and half whole wheat flour. You’ll probably want to use a recipe though (there is one in the link to NPR). Then I rolled the biscuit dough out, and cut it into rough squares. Those square I placed over the filling, leaving a few gaps here and there. It looks prettier that way, and its much easier that trying to get a perfectly even topping. Bake at 375 about 30 minutes or until juice is bubbly and the topping is brown. The result was awesome, but very tart. Almost too tart. Apparently strawberries and a little sugar wasn’t quite enough. However, one can always make desserts sweeter – that’s what powdered sugar is for! What I ended up doing is flipping the crumble over, so the biscuit is on the bottom and the fruit is on top. Then I’d sprinkle powdered sugar over the fruit. It was still tart, but in an excellent, perfectly balanced way. If I make this again, I won’t bother adding more sugar while it bakes, but make sure I have powdered sugar to add when I serve it. So to continue my tradition of posting like a week after the fact … Last Thursday was Eid – the end of Ramadan. As with all major holidays, I saw this as the perfect excuse to cook themed food. Given that it was Eid, a Middle Eastern or Persian theme seemed like the most logical option. Yes, yes I know, Islam is a global religion, and I could just as easily be cooking Indonesian food, Moroccan, Indian, Nigerian, etc. But, I don’t care. Arbitrary decisions needed to be made, and I love Middle Eastern food. And I have never really cooked it, so this struck me as an excellent excuse to do so. Of course, trying to find vegetarian recipes is often an exercise in viewing the unimaginative from others. It took awhile but finally I found something that looked excellent – Mirza Ghasemi, a Persian/Iranian eggplant dish. 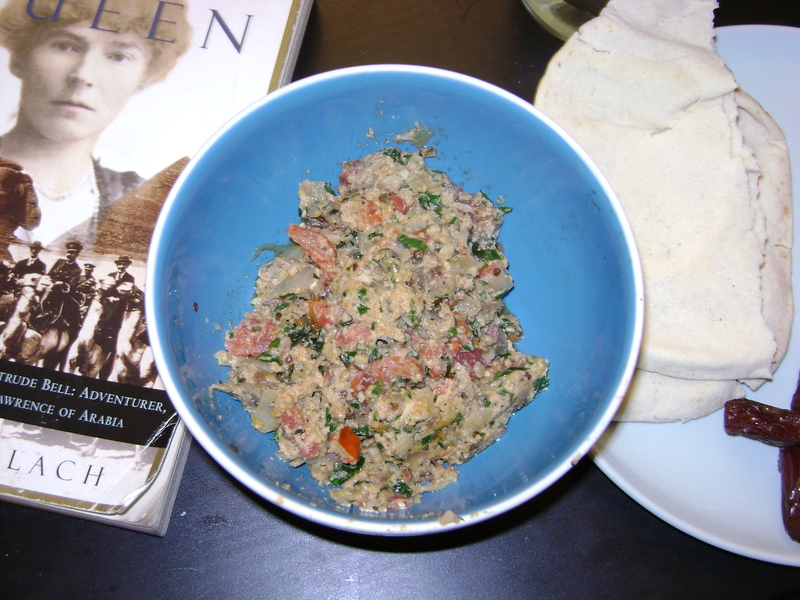 I actually conglomerated a few recipes together, but the one linked to here is the main one. There were, of course, changes that I made. Start with chopped onions and garlic, then added the cooked eggplant and some ground ginger (it says turmeric, but I didn’t buy any as I wasn’t sure how often I’d use it – I’ve made that mistake with thyme and curry powder and now they just sit there on the spice rack). Add the chopped tomato, cook and mash up as you go. The great thing about inflexible spatulas is that they can be used to mash veggies as you cook them – breaking up clumps that cook unevenly. Then, once it’s basically done, add fresh chopped parsley and mint. The combination of the two is what takes this recipe to the next level. At this point you can either add a beaten egg, mix that in till its cooked as well, or not. I’ve made it both ways, they are both good, so its really up to you. Result – freaking awesome. As you can gather, I’ve made this twice is less than a week (though I am also trying to use all my fresh herbs before they die). Still, it is awesome – if you mash the eggplant thoroughly while you cook it, it won’t get all fibrous and annoying. There are several ways to eat this – I’ve been scooping it onto pita bread (for the record, one should use only their right hand), and sometimes adding a little feta cheese on top. 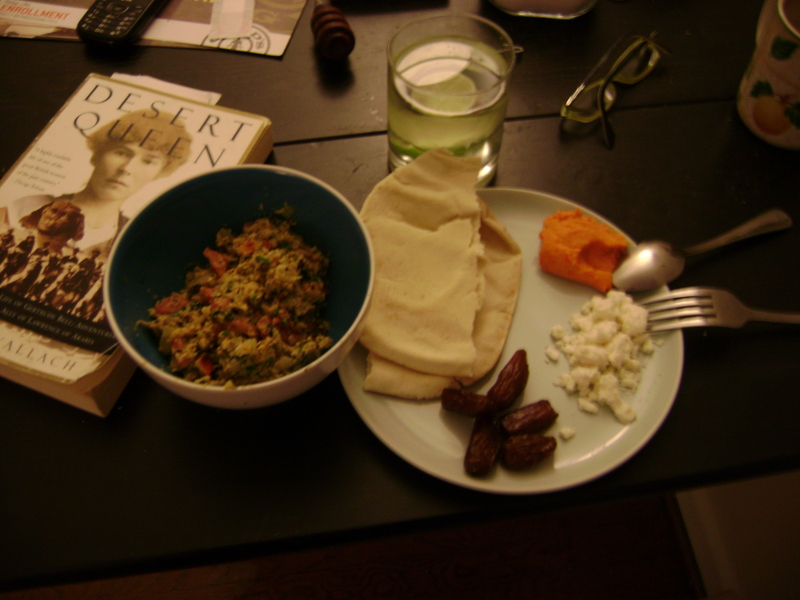 For Eid, I had this dish with hummus, pita, feta, and dates. You can pair this with white wine or a European rose, (red would probably be too much with this dish), but I had water with lime slices – drinking alcohol with my Eid meal seemed a little too much, even for a non-believer like me. Conclusion – must cook and eat more Persian/Iranian food. How many different ways can you serve ratatouille? It turns out there are a bunch. I’ve been playing with a number of them for the past week. So last week, I was looking in my fridge, trying to figure out what to cook, and realized that I had everything necessary to make ratatouille. Which doesn’t seem very surprising until you realize how rare it is for me to have both zucchini and eggplant at the same time. I always have tomatoes and bell pepper, but not so much the other two. More surprising, I’ve never made ratatouille before. I haven’t seen the movie either. Ratatouille is one of those deceptively simple dishes that is remarkably easy to mess up. Chop up garlic, onion, eggplant, zucchini, red bell peppers and tomatoes. 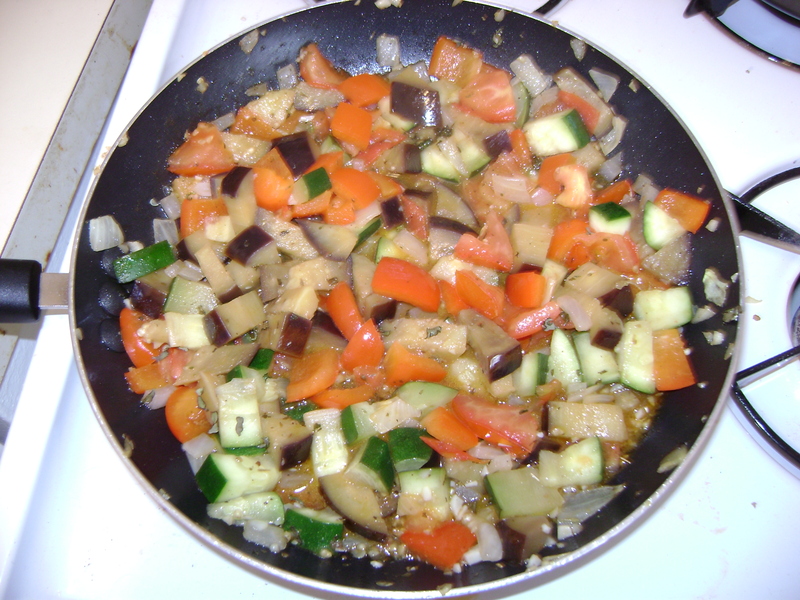 Saute in olive oil – waiting a few minutes before adding the next vegetable. Add some herbs (basil and oregano in my case) and some white wine (cause why not). Simple right? Yes and no. First, make sure you are using a large enough frying pan. You will keep adding veggies and what seems like enough room when you just have onions and eggplant in there it will probably be overfull by the time you add the tomatoes. It cooks down, but not that much. Second. Cook the eggplant for awhile before adding anything. It is shockingly easy to misjudge eggplant’s level of done-ness. My eggplant was slightly underdone, when all the other veggies were perfect. I took the eggplant out and sauteed it longer, then re-added it to the dish. Which was annoying. Cook eggplant thoroughly! Serving suggestion 1: Eat it as is. This is the obvious choice and the first one I went with. 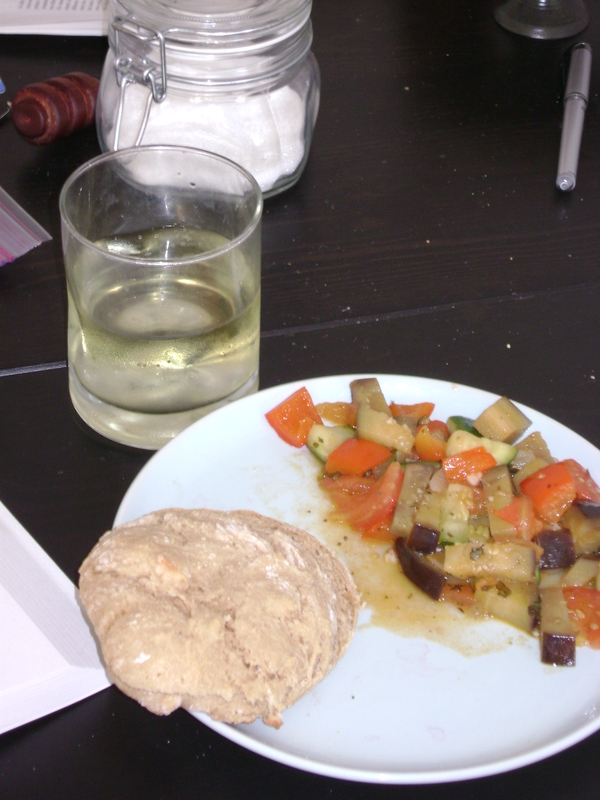 Whole wheat roll (home-made with peanut oil which worked far better than I thought it would), ratatouille, glass of wine. Simple and awesome. Serving suggestion 2: Stick it in a crepe. I’m starting to believe that everything tastes that much more awesome in a crepe. If you don’t have your own, this is the recipe I use. Stick some ratatouille in a crepe with some grated fontina cheese (works excellently with eggplant). Bake at 350 for 10-20 minutes, until the cheese melts. Serve and eat. Feel very very happy. Serving suggestion 3: Eat it in a sandwich. Now, too be fair this is fairly similar to suggestion 1, only with fontina cheese added to the mix. Or whatever kind of cheese makes you happy. Serving suggestions 4: Eat it in a omelet. This I admit I have not tried (I ran out of ratatouille – the last of it went into my sandwich for work). But, I have seen recipes for this as well. This is really more of a brunch or dinner omelet, not a make-and-eat-right-before-work thing. Again, straightforward, just make an omelet, and fill with cheese and leftover ratatouille.